Symonds Restaurant at Audley Redwood in Bristol is offering a unique, themed afternoon tea to raise money for Wallace and Gromit's Grand Appeal. This Cracking Afternoon Tea brings all the deliciousness of a traditional afternoon tea at Symonds, but it feels that little bit more special. This new delight for the senses promises to be A Grand Day Out for everyone, all while raising vital funds for a cause close to our hearts; Wallace and Gromit's Grand Appeal. The charity was inspired by the stop-motion animated short film which was directed and animated by Aardman Animations here in Bristol. As the Bristol Children’s Hospital Charity, The Grand Appeal is there every step of the way for sick children and their families. For each Afternoon Tea sold at Symonds Restaurant, £3 will be donated to The Grand Appeal. From the moment a child arrives at the hospital, its support workers offer comfort and advice; its two home-from-home family accommodations give parents and siblings a free, comforting place to stay; its specialist support staff play a vital role the rehabilitation and wellbeing of both patients and their families; and its investment in pioneering equipment and research save lives. In partnership with Aardman, The Grand Appeal has created five smash-hit sculpture trails in Bristol, London and Hong Kong, raising millions for sick children and babies across the South West and beyond. There are events taking place throughout 2019. Find out more about the appeal. Kevin Green, General Manager at Audley Redwood came up with the concept after visiting a Beauty And The Beast themed afternoon tea at the Kensington Hotel in London. "I came back with an idea to bring to Bristol a really good quality themed afternoon tea." "After considering what Bristol is famous for, it hit me. 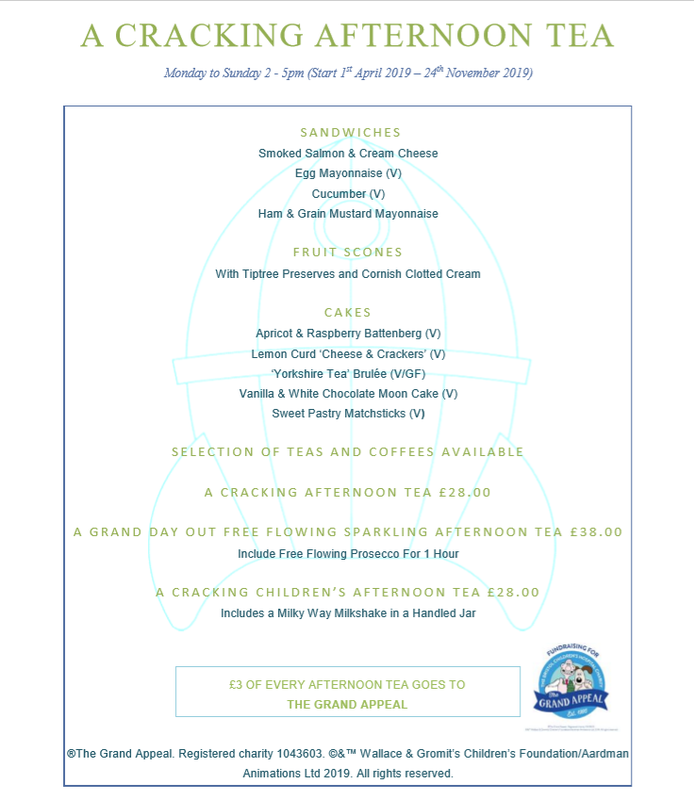 What could be more fun and well-recognised than an afternoon tea inspired by The Grand Appeal’s smash hit sculpture trails, Gromit Unleashed"
Well known in the city, and across the globe, the award-winning characters aren't short of a fan or two. Owners from Audley Redwood joined Kevin on the Gromit Unleashed 2 trails (organised by The Grand Appeal) around the city last year and from there his idea began to grow. "Our charitable and locally inspired Afternoon Tea encapsulates everything that this city is about, and we are so proud to support the brave patients and parents of Bristol Children’s Hospital through The Grand Appeal." Better still, our quintessentially British surroundings are perfect for top quality tea. Anyone looking for a grand day out, come to Audley Redwood, this will be a cracking event! Don't miss out on this unique experience, this Cracking Afternoon Tea is available to book at Symonds Restaurant from 1st April until 24th November 2019. You should never need an excuse to treat your mum, but what better time than Mother's Day... Check out the Mother's Day Afternoon Tea menu at all Audley restaurants. Now taking bookings for Easter too! Audley Villages has been given the title of Best Retirement Development at the What House? Awards. It was presented for its outstanding work at Audley Redwood, the luxury retirement village in Failand, Bristol.